synonyms: dissimulation, false virtue, cant, posturing, affectation, speciousness,empty talk, insincerity, falseness, deceit, dishonesty, mendacity,pretense, duplicity. In any case, Conservatism and lying go hand in hand and Conservatism can't survive without either one. "Thanks Obama: US Economy Adds 257,000 Jobs in January, GOP Poised to Kill Them." "...The bad news is that the new GOP controlled congress has already gone to work to kill the recovery that has finally begun to be felt by the middle class and working poor. "One of the first orders of business in the 114th congress was to pass the Keystone XL Pipeline Act which they claim will create tens of thousands of jobs while making the U.S. energy independent. "At the same time they refused to include provisions that would keep that oil in the U.S. and that would require that the steel and iron used in construction be made in the U.S.
"The State Department has said that the pipeline would create only 5,000 to 6,000 jobs for three years while the pipeline is constructed and the Natural Resources Defense Council has predicted that the pipeline would result in 100 permanent jobs at most. "Sen. Rand Paul (R-KY) and House Republicans have introduced separate “right to work” bills which would amend the National Labor Relations Act to prohibit employers from entering into contracts which require an employee to join or pay dues to a union. "The GOP has already passed three other deregulation bills favoring business as well which the president has promised to veto." And the Cons have other new ideas for us, so they aren't all that hypocritical, are they? 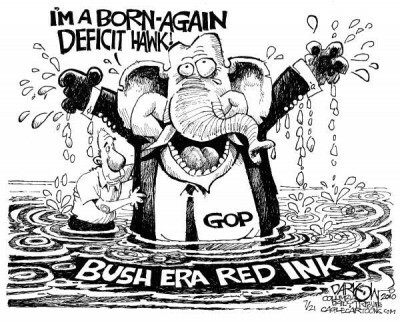 Besides, why should such knowledgeable and patriotic Americans like the Cons have to lie and dissimulate anyway? And what's so hypocritical about wanting a balanced budget anyway? And why shouldn't we believe in "limited government?" 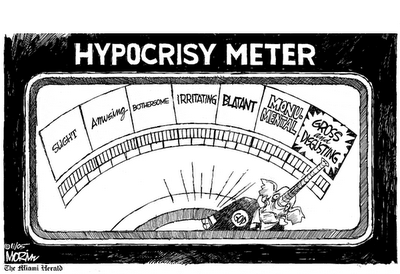 So let's check in with the Hypocrisy Meter...oopsie, never mind! While we're at it, when we're at war no American president would indulge in lies, hyperbole, or hypocrisy...would he? 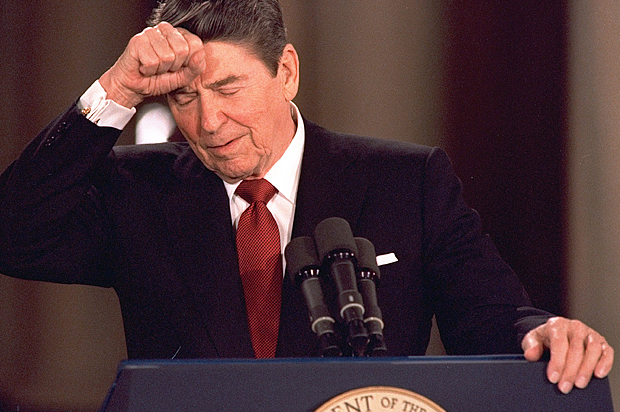 "Ronald Reagan’s wartime lies: The president had quite a Brian Williams problem." "Reagan’s fibs were manifold. They included his campaign-trail tale of a 'Chicago welfare queen' with 80 aliases, 30 addresses, and 12 Social Security cards, whom he alleged had claimed 'over $150,000' in government benefits. The woman whom Reagan made infamous was convicted of using only two aliases, used to collect $8,000. "But Reagan’s fabrications also included whoppers about conflict zones reminiscent of those put forth by Williams and Clinton. During Israeli Prime Minister Yitzhak Shamir’s November 1983 visit to the U.S., Reagan told Shamir that during his service in the U.S. Army film corps, he and fellow members of his unit personally shot footage of the Nazis’ concentration camps as they were liberated. Reagan would tell this story again to others, including Holocaust survivor Simon Wiesenthal. But Reagan was never present at the camps’ liberation. Instead, he spent the war in Culver City, California, where he processed footage from the liberation of the camps..."
Is it hypocrisy when older white male Conservatives turn the sound off when the news is on, or just some sort of passive-aggressive nonsense? So children, don't let your moms grow up to be rightwingers..
Because that party isn't a democratic party, it's the GOP, and they HAVE to lie...because beneath all those phony issues of abortion and "states rights" they don't believe in what they mouth for their followers anyway. Unleashed capitalism in the form of monopolies. All the rest of those social issues are smoke and mirrors, gang. So before it's too late,don't you think it's high time we criminalized "Conservatism?" "A Conservative Government is an organized hyBpocrisy."